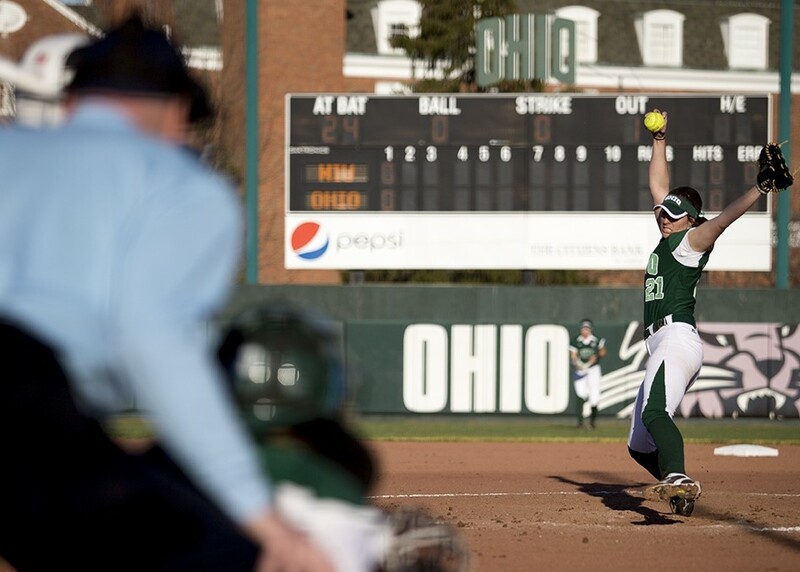 Ohio redshirt senior pitcher Savannah Jo Dorsey pitches against Northern Illinois during the top of the second inning at the Ohio Softball Field on Feb. 17, 2017. Dorsey is the program leader in wins, innings, strikeouts, complete games and shutouts. Dorsey is in the middle of her family’s Ohio legacy. Her mom, Rona, pitched for the Bobcats in the ‘80s. Her sister, Michaela, plays outfield for the Bobcats. White, who graduated in 2017, holds the the Bobcat program record for season scoring average. He is now playing professionally in PGA Latin America. Lampkins graduated from Ohio in 2017. She is the second-leading scorer in program history for basketball. Lampkins played for BC Winterhur in Switzerland last season. Claxton, a former wrestler for Ohio, is now in the mixed martial arts organization Bellator. Claxton made headlines with a “flying knee” knockout at Bellator 186. Basham was drafted by the Indianapolis Colts in the third round of the 2017 NFL draft. Basham holds both the single-season and career sack records for the Bobcats at 11 1/2 and 29 1/2, respectively. Brown, a linebacker, was selected in the fifth round of the 2017 NFL draft by the Jacksonville Jaguars. He was named to the 2016 Pro Football Focus All-American Team. He jumped from a low-level prospect to a top scorer for his position at the NFL combine following his senior season. Cooper was a key part of Ohio’s most recent NCAA Tournament runs. He was a part of the team that upset No. 3 Georgetown and made a Sweet 16 run. The Bobcats also upset Michigan before losing to North Carolina in overtime. He is now playing overseas with Monaco. Hunter is the all-time leading rebounder in Ohio history. He is the most recent Bobcat to be drafted in the NBA, going in the second round to the Boston Celtics in 2003. After three NBA seasons, Hunter has played for multiple teams overseas. Trent was a three-time Mid-American Conference Player of the Year. His play earned him the nickname “Shaq of the MAC.” He was the 11th pick in the 1995 NBA Draft by the Milwaukee Bucks and played in the NBA for 10 seasons. Trent’s No. 20 jersey is retired by Ohio. Jamerson is Ohio basketball’s all-time leading scorer and is the only Bobcat to have scored 60 points in a game. Jamerson was picked 15th in the 1990 draft by the Miami Heat and played three NBA seasons. His No. 33 jersey hangs in the rafters of The Convo. Graham was named MAC Freshman of the Year in 1986 and was also two-time All-MAC First Team. After his college career, he enjoyed an extensive career, both overseas and in the NBA. He played in the NBA for the Atlanta Hawks and once scored 82 points in a game in Australia. The only Bobcat to grace the cover of Sports Illustrated, Luckett held the program record for scoring until Jamerson broke it. Luckett played at Ohio for three seasons. He was drafted No. 27 by the Detroit Pistons but never played in the NBA due to a knee injury. Swisher played in the College World Series in his time for Ohio and was also named to the All-American team. He was drafted in the first round by the Chicago White Sox in 1973. He played nine seasons in the majors and was named to one All Star game. His son, Nick, also played in the big leagues. Schmidt shouldn’t need a introduction. 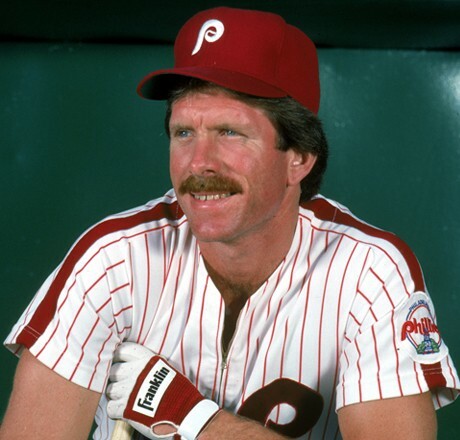 He was a star for the Philadelphia Phillies in the ‘70s and ‘80s. He led the Bobcats to a College World Series appearance in 1970. Schmidt hit 548 career home runs, is a 12-time All Star and was a three-time MVP. He was elected to the Baseball Hall of Fame in 1995. Powell was the second black woman to play on the LPGA Tour. She is the head professional at her family’s Clearview Golf Club in East Canton. Powell won the 1973 Kelly Springfield Open.